Alvin® Ensign Table, White Base White Top 31" x 42"
Home > Drawing Supplies | Drawing Tables & Art Tables | Alvin® Ensign Table, White Base White Top 31" x 42"
The eggshell base of this drawing table coordinates perfectly with its white Melamine® top. The sturdy steel legs give this unit a steady strength that you can count on when it's time to draw. The Alvin Ensign Eggshell Base w/31X42 Top unit, with its eggshell base and bright white drawing board, is a practical as well as attractive drafting table. Its design allows for a high degree of customization to create just the right height and angle for working. 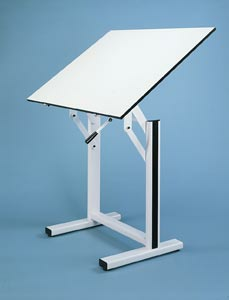 The angle adjusts from 0 to 90 degrees, and the height of the table adjusts from 35" to 47". The table is easily adjusted for both angle and height with an extendable brake lever. The traction springs keep the adjustments easy and balanced. The heavy-gauge steel of the base creates stability with its double-pedestal design. Work worry free on the Melamine® drawing board that won't warp. The tools you need for assembly are included. Oversize Shipping is $66.45.